With offices becoming smaller and cost per square metre increasing, holding onto clutter and stuff comes at a cost, not only to our quality of life and productivity it also comes at a cost to our planet. Our homes and offices don’t come with elastic walls, when they become cluttered they don’t function well, effecting productivity, health, increasing stress levels and finances. With commercial real estate priced per square meter or in the co sharing workspace per hour, setting limits on clutter is just as important. If the workspace is underutilised acting as a dumping ground rather and a productive inspiring space to work, the question is, is clutter holding you back from securing clients or good staff? Just by moving to bigger premises does not solve the issues, the solution is decluttering, organise and setting limits on what you bring into your space. Does it add value to my role? How long before I will see a return my investment? What are the servicing and consumerables costs? What is the recycled content? Outsourcing storage of delinquent or out of date clutter and stuff costs $100’s per month, with one storage company admitting to me, some units sitting untouched for many years, in one instance 20 years. Great to see Google and Facebook taking an eco-friendly approach, although I question the amount of digital clutter we produce and store. Clutter in any form hinders our ability to function, reducing productivity, costing us time, space and money, so why hold on to it. Keeping in mind every tree produces enough oxygen for 3 people to breathe and it takes 300 – 400 ton or cubic meter of water to make one ton of paper. Source Paper on Web. 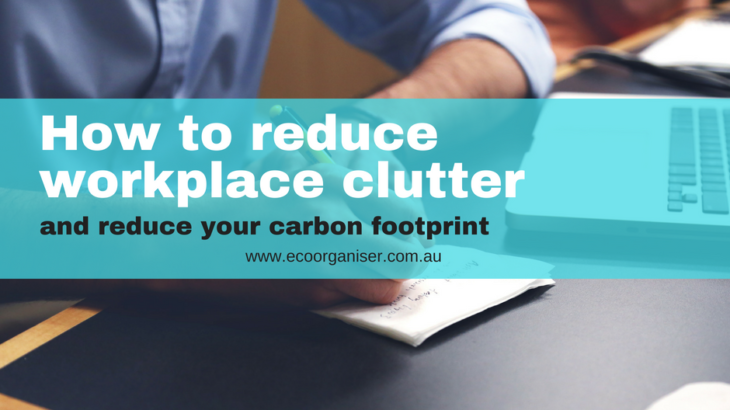 Business Organising Tips clutter, office, productivity, reduce, reduce carbon footprint, stuff, workplace. permalink.